Yet another mom’s signature dish straight from Kerala. 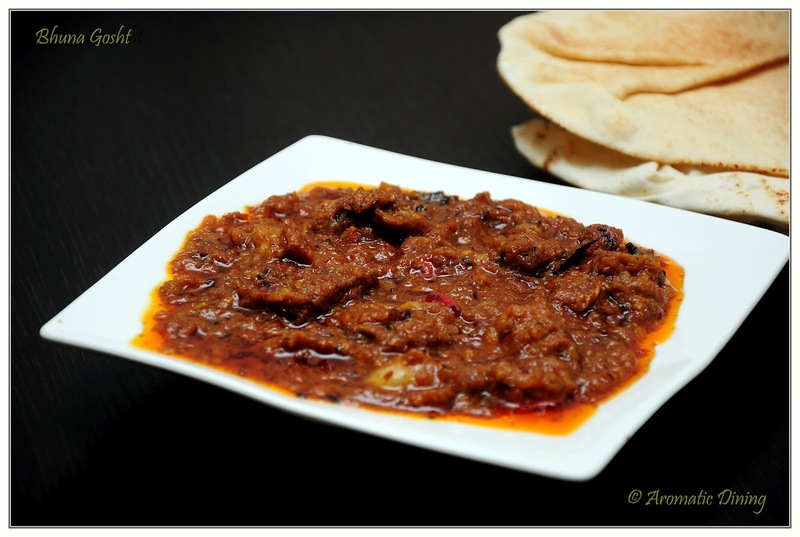 Moru kuttan is very common in Kerala and easy to make. This is a yogurt based vegetable curry flavored with coconut. Traditional tempering adds more flavor to the curry. This simple yet yummy curry will woo you for sure. 1. Peel the skin of ash gourd and chop them into cubes. on medium heat and cook for 10 mins. 3. Grind the grated coconut with cumin seeds and green chillies by adding little water to a coarse paste. 4. Add the coconut paste to the ash gourd and mix wel. Cook further 5 more mins in low flames. 5. Turn off the heat and add the beaten curd and mix. Transfer to serving bowl. dried red chillies and curry leaves respectively. 7. Pour the tadka on to the curry. Serve with steamed rice. This recipe can be used to make Yam, raw mangoes, raw plantain, pumpkin moru kootan. I haven’t used curry leaves as I don’t get it here. Adjust the quantity of curd according to the sourness. 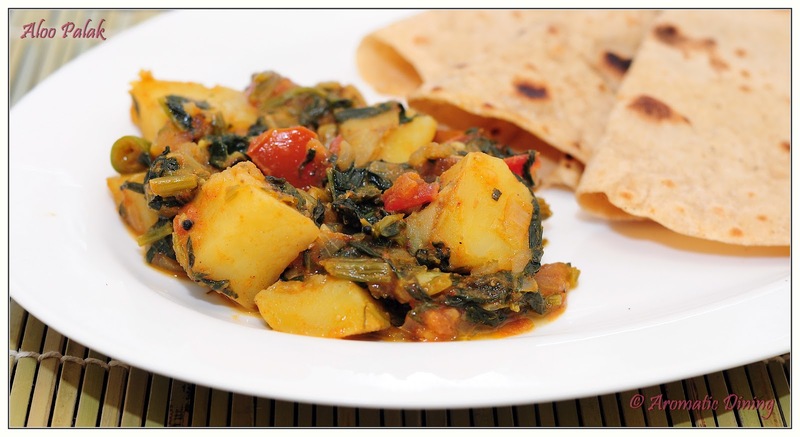 Aloo palak is a subtle spinach dish with potato. 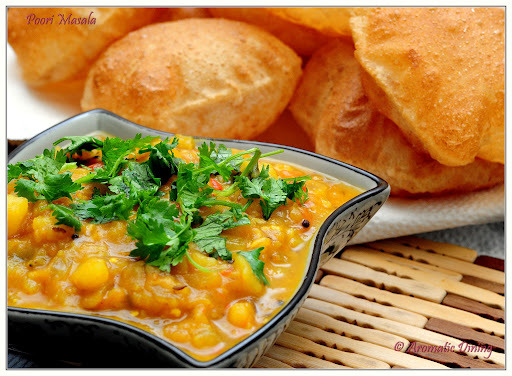 This is a healthy and delicious veggie delight to go with roti or any other Indian bread. I have seen some people use pureed spinach in this. But I use chopped spinach along with stems. I believe pureeing would kill all the nutrition the spinach holds. Anyways thats all upto to you.. For me I like the texture of my aloo palak more than that of pureed spinach masala.. And also I use to saute them in brief so that I can get most of its vitamins 😉 Such a health freak huh? 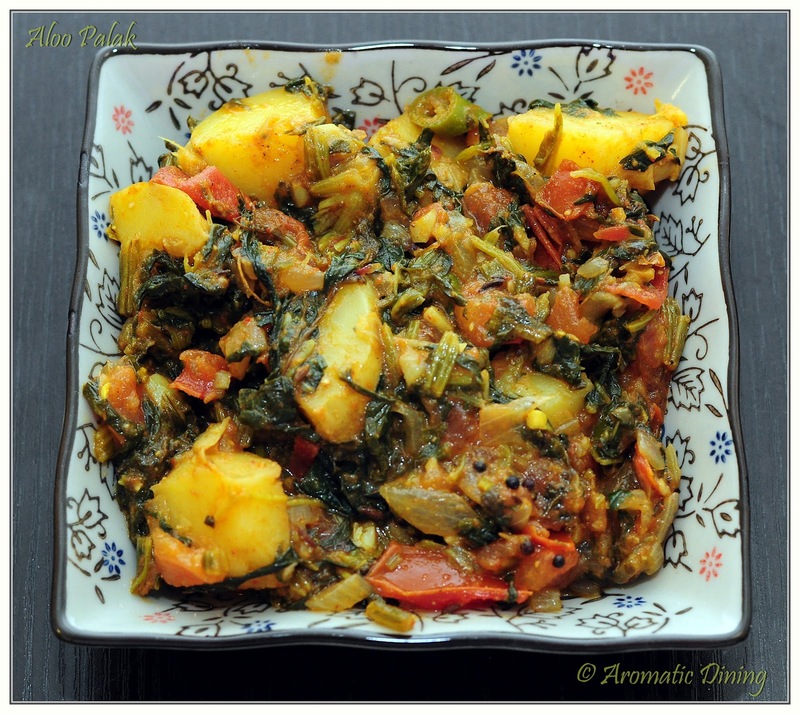 ?… So here’s my Aloo palak in my style..
1. Clean the spinach in cold water and drain the water. Chop them roughly. 2. Boil the potatoes with skins on and cube them into large chunks. 3. Finely chop the onion and tomato. Chop one green chilli..
2. Add mustard seeds and allow to splutter. 3. Now add cumin seeds and asafoetida. 4. When cumin seeds stop spluttering, add in the onion and green chilli with little salt. 5. Stir fry till onion turns brown and nicely fried. 6. Add ginger,garlic & green chilli paste and saute well for 1-2 mins. 7. Add turmeric powder and tomato now. 8. Saute for few more mins or till the tomato softens. 9. Add coriander powder, red chilli powder and fenugreek leaves. Saute well. 10. Now add the spinach and drizzle some water. 12. Cook in medium flame till the spinach gets cooked well. 13. Add the boiled potato and stir well. 14. Check for seasoning and adjust salt . 15. Let the gravy thickens a bit. Turn off the heat and add garam masala. 16. Transfer to serving bowl and serve with rotis. 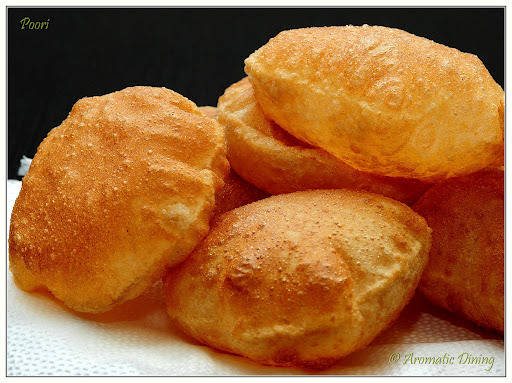 Poori Masal or Poori Kizhangu as referred by my dear hubby is a classic south Indian breakfast combo. Pooris are deep fried indian bread made with wheat flour. And masala is nothing but mashed potato with Indian tadka. 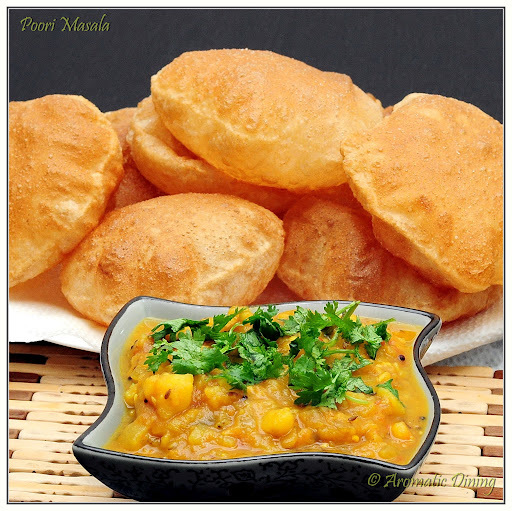 Alas, I have a slight food aversion towards this dish since many years 😦 , but on the other hand my sweetheart crave for poori kizhangu ;).. I rarely prepare this at my kitchen due to my aversion. I cooked poori masala last week since he was starving for it for long time. I am glad to dedicate this wonderful recipe to my sweet hubby. Sieve the flour and salt together. Add the sooji and oil to the flour. Add warm water little by little and knead well. Dough should be little harder than roti dough. Keep covered with damp cloth. After 10-15 mins, knead the dough again by adding little oil. Divide the dough into gooseberry sized balls. Roll them round using rolling pin and rubbing oil on both sides. In a shallow pan heat oil for deep frying. 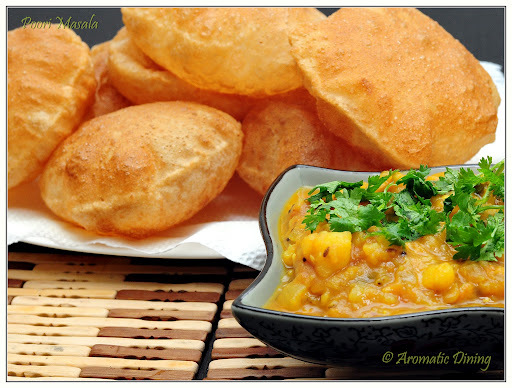 Fry the poori till it puffs up by turning both sides. Boil the potatoes in a cooker or pan with skins on. Once cooked remove from heat and drain the water. Run cold water over the potatoes & peel off the skin. Mash it using potato masher or spatula. Chop the onion, tomato, ginger, garlic and green chillies finely. Heat oil in a pan. Add mustard seeds, asafoetida and cumin seeds. Allow to splutter. Add curry leaves and onion. Saute for 3 mins till onion turns golden brown. Add ginger, garlic and green chillies. Saute well. Add turmeric powder and tomatoes. Mix well and cook till tomatoes become soft. Add the mashed potatoes and 11/2 cups water. Mix well till it blends with the masalas. Let it boil for 5 mins. Check for salt. Garnish with chopped coriander leaves and transfer to serving bowl. Adding sooji to the dough makes crispy pooris and retain the crispyness for long time. My husband’s aunt used to add ground pottukadalai / poricha kadalai/ fried channa dal to the masala while adding water to increase the gravy quantity. I didn’t use due to unavailability. But that part is best when you make masala for many. Last weekend my husband and I went to downtown for grocery shopping. After shopping, with heavily loaded bag we got into a taxi and somehow my husband managed to guide the driver to the nearest metro station Xiaobei to get back home. The guy was so surprised and happy to see my husband speaking broken Chinese ;). While trying to explain about the metro station, he nodded for some reason and asked whether we are going for dining. We were confused and was checking GPS all the way till we got there. When finally we got down in the right destination we realized huh!! That’s what he meant.. I guess he thought we are from middle east countries and we are heading to have dinner at Arabic street.. The street is full of Arab restaurants and stores.We’d no idea such place exists in here.. We bookmarked the place to reach out again for Middle east cuisines. But we did go through a store selling imported foods from Arab countries. As our days shopping had over, we just had a look around. But one thing caught our eyes lying on the bakery was Pita bread. I’d heard many recipes of Pita bread but never got a chance to use them. So quickly i grabbed one pack. The next day we made sandwiches with pita. With 2 more breads left and we both were craving for spicy meat dish for long, I decided to cook “Bhuna Gosht” to have with pita breads. Its not traditional but pita bread is very similar to Naan bread. So went very well with Bhuna gosht. Bhuna Gosht is all about spices. 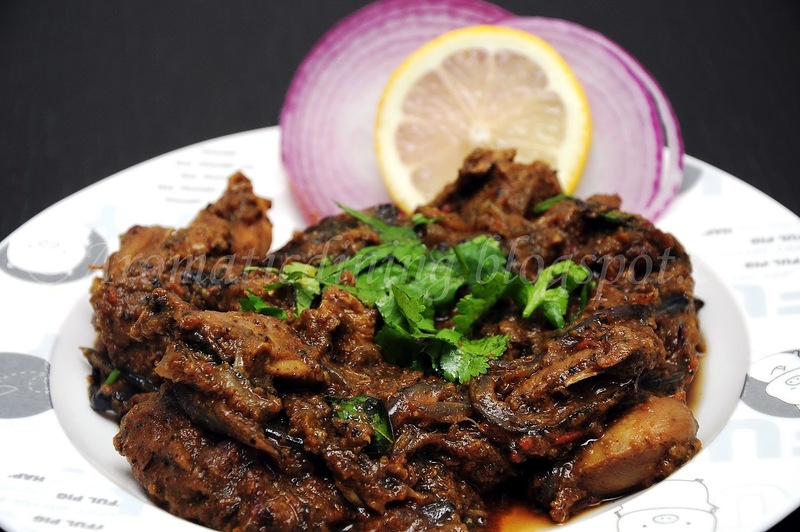 Mutton is slow cooked with loads of spices for hours. The slow cooking process gives the brown color to the dish. It takes 1-2 hrs to cook the meat along with all the spices. But its worth the wait. It is rich and Lip smacking delicious. It can be made easier by using pressure cooker. But there is no room for taste when you hurry up for this dish. My advice is to make this recipe when you have plenty of time and mood of cooking something special for your tastebud…. I love the Bhuna gosht recipe from “ecurry” and this recipe has been adapted from them with slight variation. cumin powder, red chilli powder, pepper powder and salt. Mix well with the meat and leave for 20 mins. 2) Chop the onion, ginger, garlic and green chillies finely. 3) Blend the tomatoes in a blender and set aside. 1) Heat 1 Tbsp Oil in a large skillet. green cardamom, cloves, and black cardamom pods respectively. 3) Add chopped garlic ginger and sauté well for 1 min. 4) Now add the chopped onion and green chilli along with little salt. Adding salt will ease the frying process. 5) When the onions have turned to brown, sprinkle mace and nutmeg powder. Sauté for few seconds. 6) Add in the blended tomato and combine well. Add the marinated meat. another 15-20 mins or till the oil floats and the gravy is thick. 9) Garnish with coriander leaves and sliced onion. 10) Serve with naan, rice or any Indian bread. 2) Yogurt is optional. Instead you can use 1 Tbsp of lemon juice while marinating. 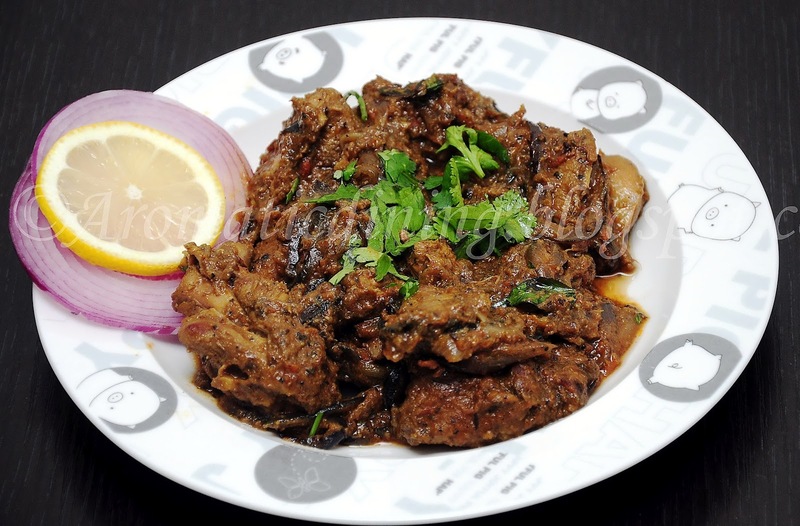 3) I have used boneless mutton pieces. Better way is to use boned meat. 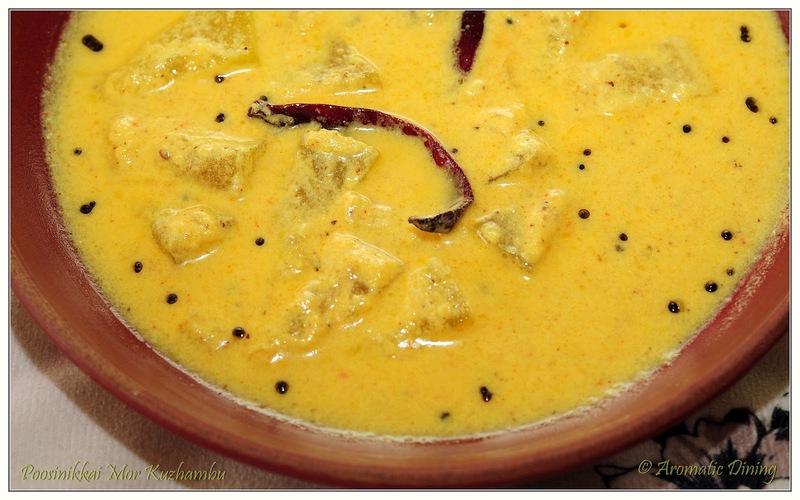 Another vegetarian dish from Kerala “Kaippakkai Theeyal”. Kaippakkai meaning “Bitter gourd”. You could also use vegetables like yam, pearl onion, raw mangoes, eggplant in place of bitter gourd. It’s a curry made with roasted spices,coconut and the vegetables are boiled in tamarind water. recipe is full of flavours. From sourness from the tamarind, sweet from coconut & jaggery, to slight bitter from the bitter gourd makes this dish delicious. I like my theeyal with steaming hot rice and chutta papadam (Papad toasted in charcoal or fire). Give it a try and I am sure you will like it. 1) Dry roast the ingredients given under grinding except coconut and transfer to grinding jar. 2) In the same pan dry roast the grated coconut till brown and transfer to the same grinding jar. 3) Grind them using ½ cup of water to a paste. 4) Chop the pearl onions coarsely. 5) Slice the bitter gourd thinly. 6) Soak the tamarind in ½ cup of warm water for 5 mins. And squeeze them to extract tamarind paste. 1) Heat ½ Tbsp Oil in a pan. 2) Add asafoetida and chopped onions. 3) Fry till onions turn golden brown. Now add little turmeric powder. 4) Add the sliced bitter gourd. Saute well to combine. 5) Add the ground paste and salt. Stir fry for a minute till it is mixed well with the vegetables. 6) Pour in the tamarind water, mix well and bring to boil. 7) Once boiled, reduce the flame to low. 8) Close the lid and cook till the bitter gourd becomes soft. 9) Finally before turning the heat off add jaggery. Turn off the heat and transfer to serving bowl. 10) Take another pan and heat oil. 11) Add Mustard seeds. When it splutters add curry leaves and sliced onions. 12) Fry till onion become golden brown. 13) Pour the tadka onto the theeyal. 14) Serve with steamed rice. 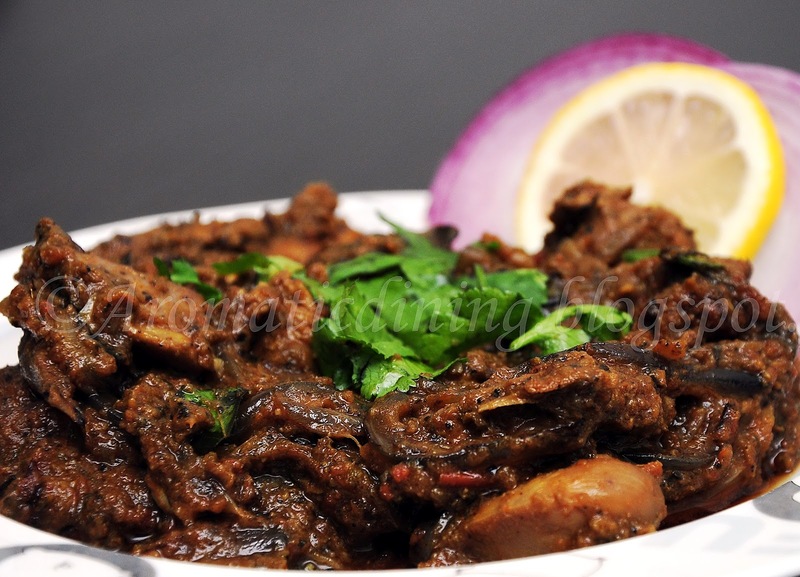 1) Theeyal also can be made using okra, eggplant, raw mangoes, yam, pearl onions. 2) Adding jaggery is optional. Adding jaggery lessens the bitterness from the bitter gourd. 3) The brown colour of the curry comes from the fried coconut and coriander seeds. So you need to fry them well. Black pepper is one of my favourite ingredient, especially when used in Non veg preparations. 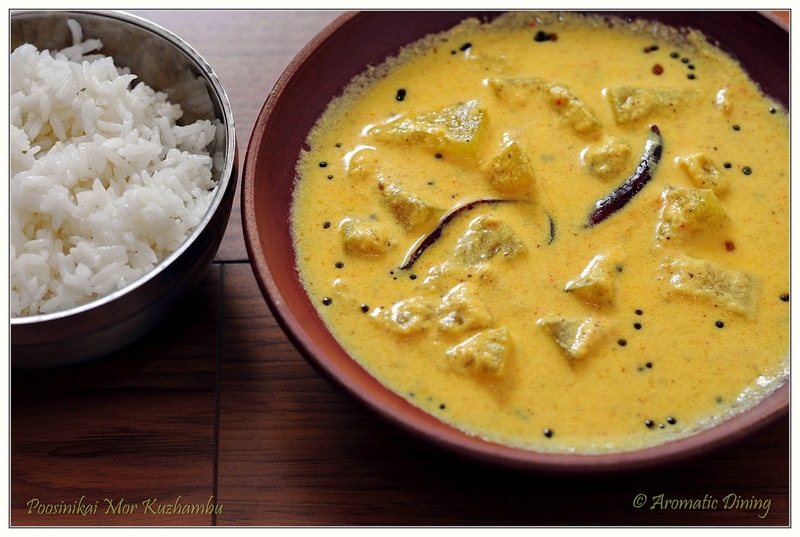 I am posting Pepper chicken recipe with a touch of Kerala tadka. The taste totally rely on the fresh ingredients we use to prepare. So I have used fresh ingredients wherever I can. This is definitely a treat to your taste bud. We love to have pepper chicken along with rasam and rice. However it can be also served with Indian bread. Nothing is as heavenly as an ice cream after this peppery meal. 2) Grind the coriander seeds to fine powder and crush the peppercorns to coarse. 3) Make a paste of ginger, garlic and one green chilli. half of the crushed black peppercorns. Marinate for atleast 15 mins. 1) Heat 1 Tbsp Oil in a pan. 2) Add cumin and allow it to splutter. 3) When it splutters add cinnamon, cardamom, cloves and bay leaves. Sauté for 30 sec. 4) Now add half of the thinly sliced onions. Stir fry till it becomes translucent adding little salt. 6) Add the marinated chicken and combine well. Stir till chicken turns white. 7) Now add the tomato paste and 1 cup of water. Mix everything well. to avoid gravy sticking to the pan. Check for salt and if needed add it. 9) When the gravy is thickened add the remaining crushed peppercorns. Stir to mix well. 10) Turn off the heat. 11) Take another pan and heat oil. 13) Transfer this mixture to the chicken and combine well. 14) Garnish with coriander leaves and onion. Serve with rice or rotis. 1) While marinating, instead of lemon juice you can add vinegar or yogurt. 2) Tadka step is optional. The taste of fried onion and curry leaves adds special taste to the gravy. 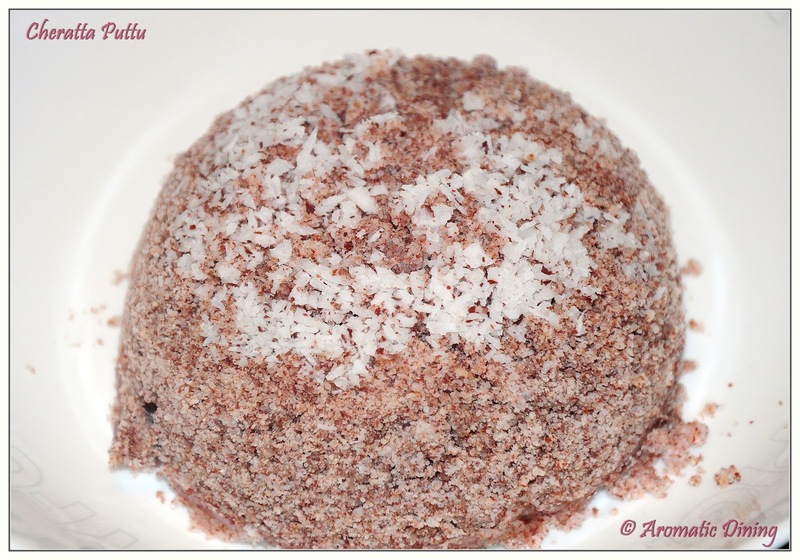 I have come up with one of the highly popular and most desirous recipe from Kerala”Puttu” (Malayalam). Usually served for breakfast along with “Chickpea curry”. “Puttu” is a dish made by steaming rice flour using cylindrical vessel and so the shape of puttu is cylindrical. It is called “Kuzha Puttu”(Kuzhal = Small Cylindrical pipe). Another way of steaming puttu is by using half coconut shell which is called “Cheratta puttu” (Cheratta = coconut shell). Nowadays some variation of puttu uses wheat, rava, whole grains etc.. Also you can find readymade flour for making puttu. On the other hand, the accompaniments also varies widely. Most common is chickpea curry, banana and palm sugar. Also goes well with any other curries and non veg curries. Since puttu is steamed, it is considered very healthy food. To add more healthiness and naturalistic to the dish, I have tried red rice flour and steamed using coconut shell. Instead of Kadala curry, I made Kerala Chicken curry (Nadan Kozhi Kuttan) to go with puttu. 1) Dry roast the rice flour using pan. 2) Let it cool for 2 mins. 3) Add salt to the warm water and mix well. 4) Now add the warm water little by little to the rice flour mixing them well. 5) Stop adding water when the consistency of the flour becomes somewhat moisture. When you hold the mixture tight in your palm, it should form a ball. 6) Rice flour should have moisture in it but not lumps. 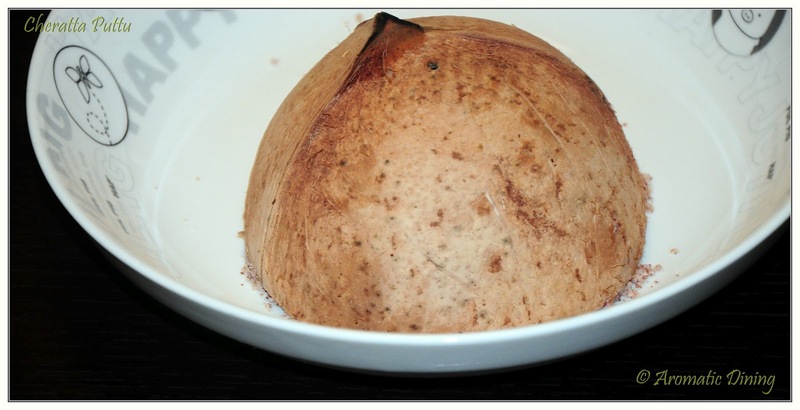 7) Clean the halved coconut shells using water. 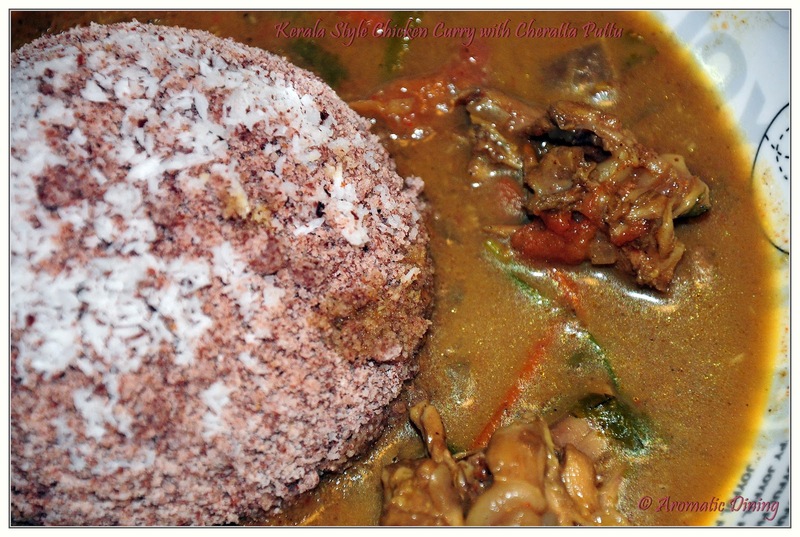 8) Sprinkle 1 Tbsp of grated coconut in each coconut shell. 9) Divide the rice flour into two. Add each portion to each coconut shell. 10) Sprinkle another 1 Tbsp of grated coconut at the end of the filling. 11) Boil water in electric rice cooker (or) in a large pan (or) in idli cooker (or) any other steamer. bottommost idli plate or if you are using any other steamer prepare the steamer for placing the shells. 14) Steam for 10- 15 mins. avoid any fall off of rice flour. 16) Place it on a plate and gently remove the coconut shell alone from the steamed rice flour. 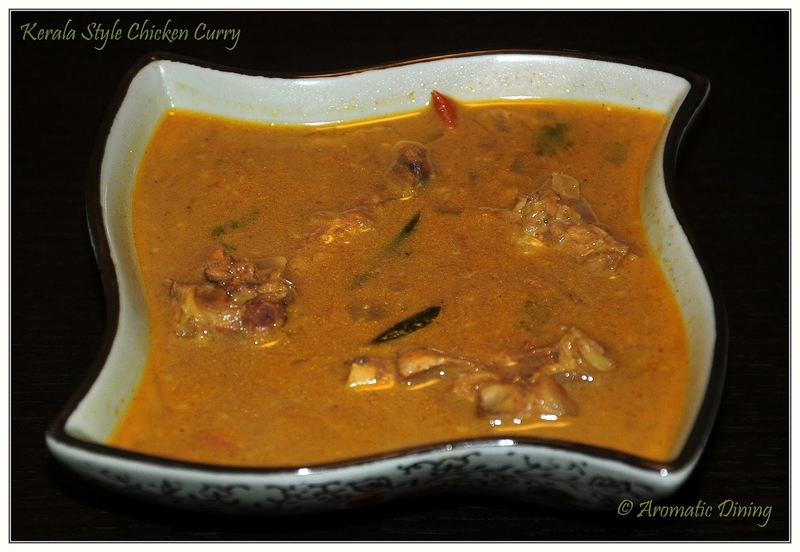 17) Serve hot with chicken curry. 1) Use white rice flour, wheat flour, rava or any other whole grains in the place of red rice flour. Just make sure it should be coarsely powdered. 2) Adjust the steaming time according to your steamer. Normal steaming time is 10 min in medium flame. 2) Chop the onion, green chiliies and tomatoes. 3) Heat 1 tsp oil in a small pan. 4) Add all the ingredients given under roasting and grinding except ginger and coconut. 5) Roast till the spices leave aroma and the seeds are lightly brown. in the same pan till it become golden brown color. Set aside. 7) Grind the coriander mixture adding the ginger and water little by little to a fine paste. 8) Add the coconut to it and grind to combine well. 2) Add curry leaves followed by onion and fry till translucent adding little salt and turmeric powder. 3) Add the green chillies and tomatoes to the onion. Stir fry for 4-5 mins. 4) Now add the marinated chicken. Toss till the chicken turns to white color. 5) Add the ground paste and 1 cup of water. Mix well. 6) Bring the heat to low. Close the lid and cook for about 15 mins. 7) Check chicken pieces for doneness. If needed add more water and allow boiling. The curry should be watery in consistent. 8) When done, garnish with coriander leaves. Serve hot. 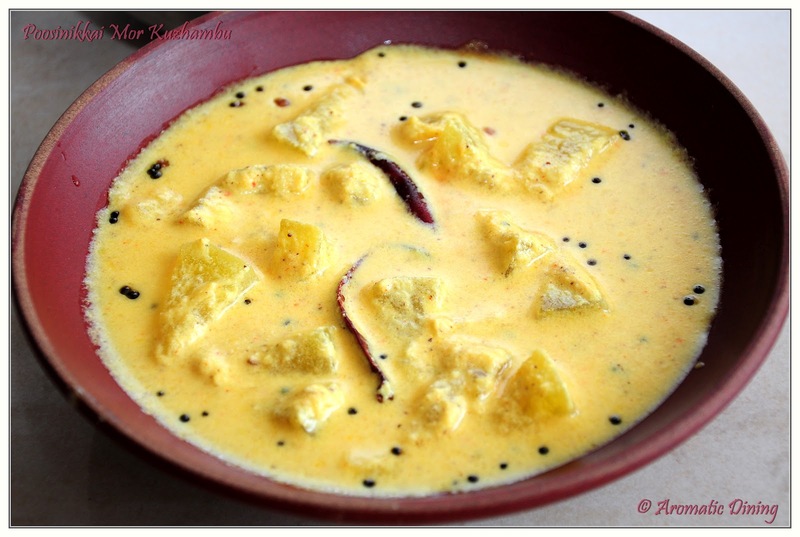 1) Instead of grated coconut, you can also use coconut milk. In that case use 1 cup of milk. 3) If you don’t have whole coriander seeds, use coriander powder.